With little or no irrigation. The white varieties of the vineyard are Sauvignon Blanc & Moschato of Alexandria. Malagouzia is also planted in the new vineyard in the winery. In the red varieties Merlot dominates and there are also vineyards with Cabernet Sauvignon and 10 acres of Agiorgitiko. 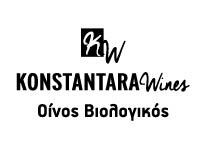 The Konstantaras wine-making unit is extremely family-run with limited and highly-sophisticated production. The winemaking takes place in the privately owned facilities of the new modern family winery in Portaria, Halkidiki.